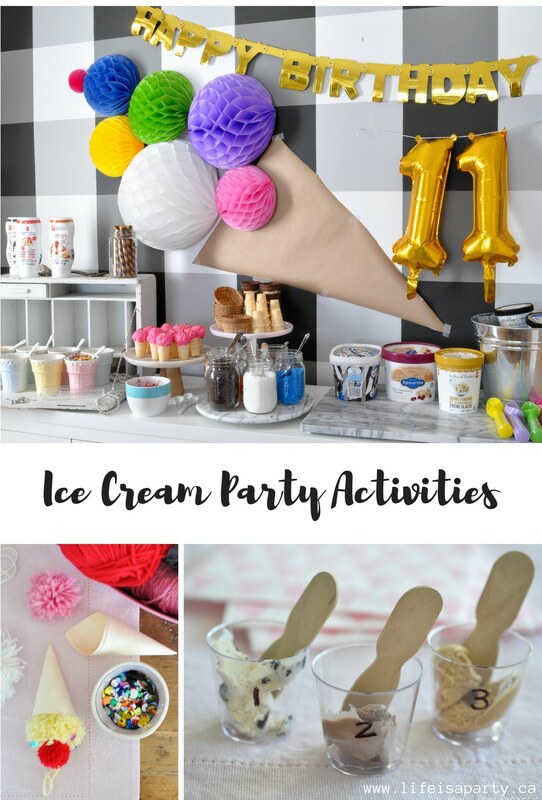 Ice Cream Party Activities: invent your own flavour of ice cream, make ice cream cone crafts, have an ice cream taste test, play ice cream shop, and more! 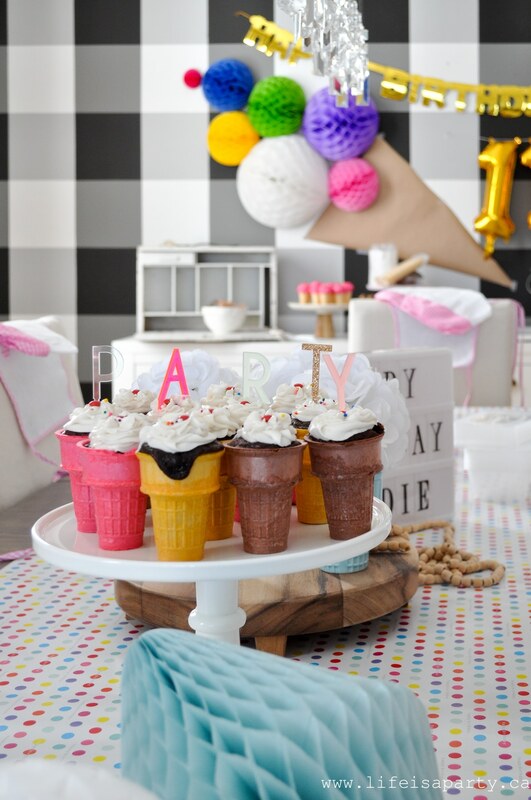 There’s a reason that I scream, you scream, we all scream for ice cream -and it’s this Ice Cream Themed Birthday Party! 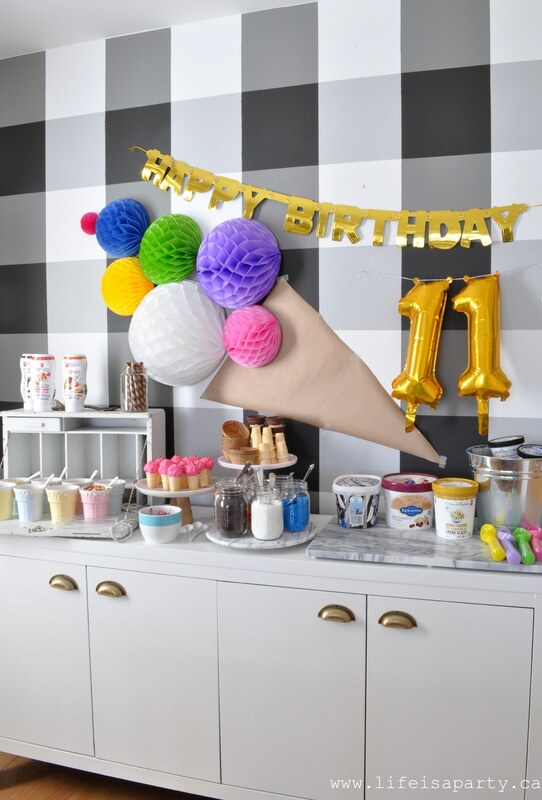 Yesterday I shared all of the fun decor from our Ice Cream Themed Birthday Party. 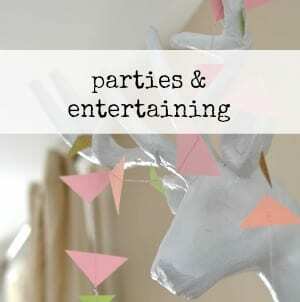 Today I want to tell you all the fun Ice Cream Themed Activities that the kids did at the party. Admitted we had a lot going on. It was a four hour party over lunch. Because we don’t tend to do a lot of play dates around here, Maddie wanted a good amount of time to hang out with her friends. I would rather over plan for a party and run out of time than run out of things to do. I tend to think that busy kids are the best kid of kids (leftover from my teaching days). We did end the party with about a half hour of play time in our pretend ice cream shop, but we’ll get to that soon. 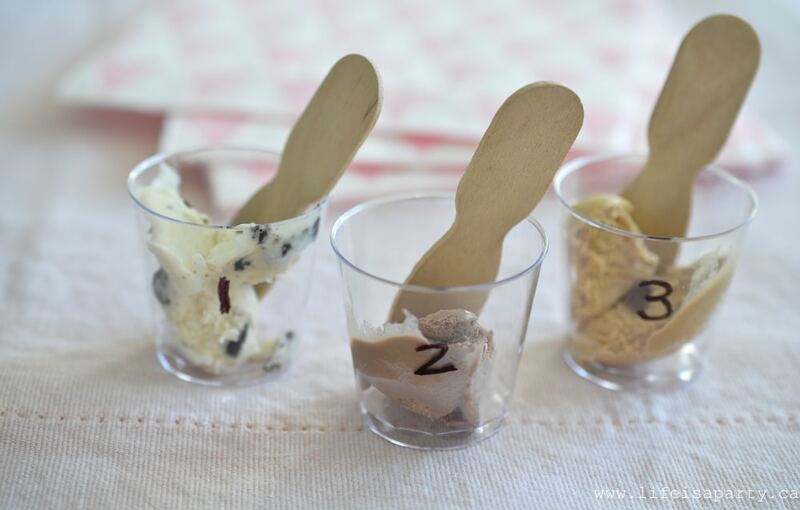 Our first activity as the girls arrived was to make our own new ice cream flavours. 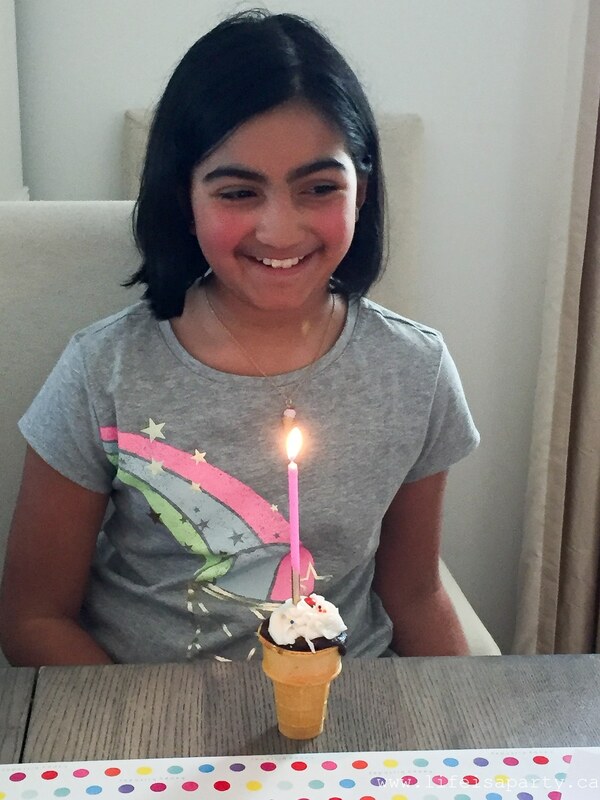 Our first activity at the Ice Cream Birthday Party was for our guest to invent their own ice cream flavour. Our little chefs were invited to suit up for the occasion with their own chef hats and aprons when they arrived. Next, our ice cream flavour inventors got to choose a container and make a label for their new flavour with what ever they’d want to name it. Some of the names were really cute and really creative! We had cute containers and sticker labels. The girls got to write the new flavour name and then decorate their labels with markers and washi tape. Next it was into the kitchen to actually create their new flavours. We had a base of homemade vanilla ice cream for everyone. 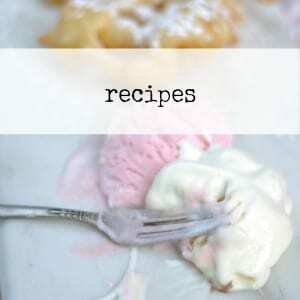 The churning of the homemade ice cream was timed so that it would be ready for them but still soft so that it would be easy to mix in anything they wanted. We had lots of fun add-ins for the ice cream inventors. There was peanut butter, nutella, chocolate sauce, strawberry sauce, and caramel sauce. There was also fresh fruit and jams. 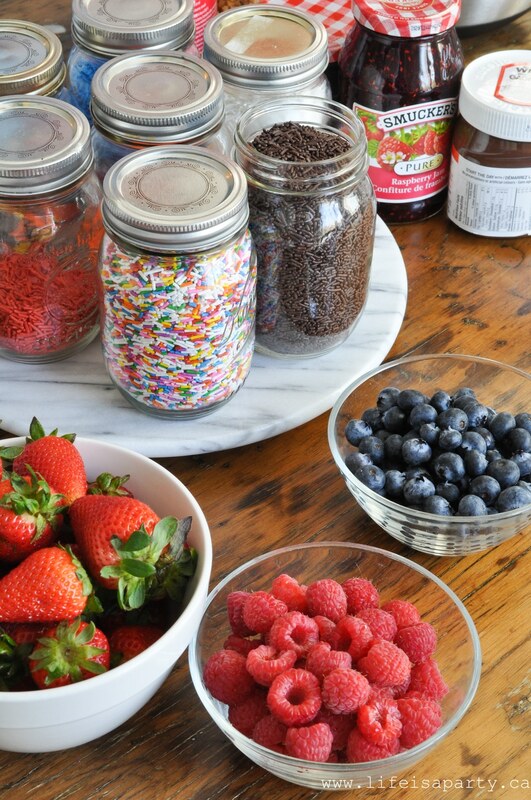 We also had a whole bunch of different sprinkles and candy add-ins. 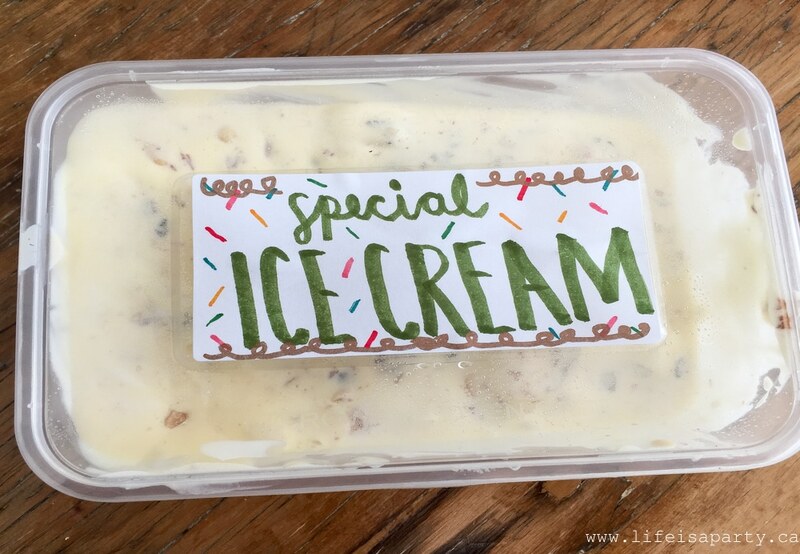 After the ice creams were created our guests put their labels on, and we popped the new ice cream flavours into the deep freezer for the rest of the party. At the end of the party we added them to their “Make Your Own Sundae” take home kits as loot bags. 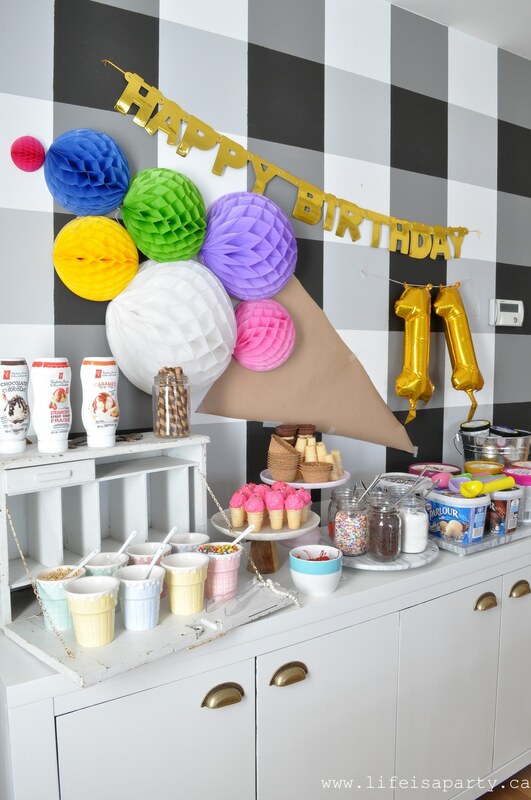 Everyone got some assorted cones and waffle bowls, chocolate and caramel sauce, and some different little bags of sprinkles and candies to have with their ice cream at home. These were a real hit with the kids, and they couldn’t wait to tell their parents when they came to pick them up. 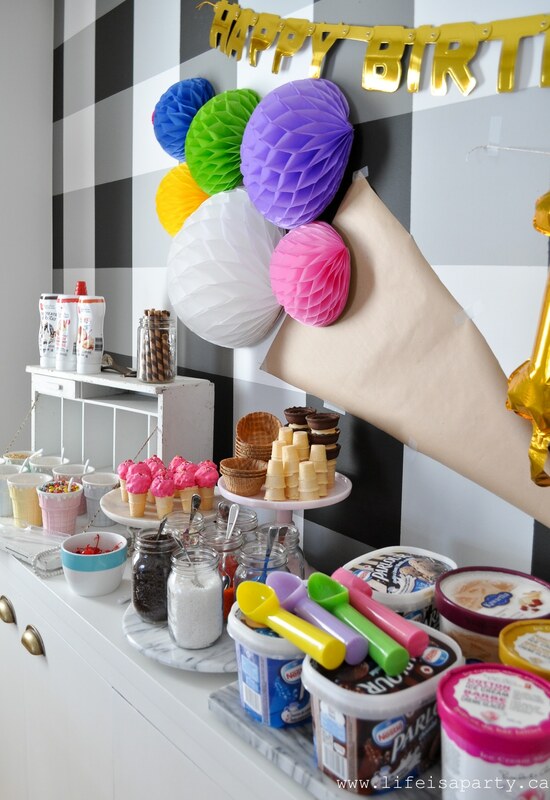 These cute pom pom ice cream cones were really fun to make, and everyone was able to personalize theirs with their own colour choices. 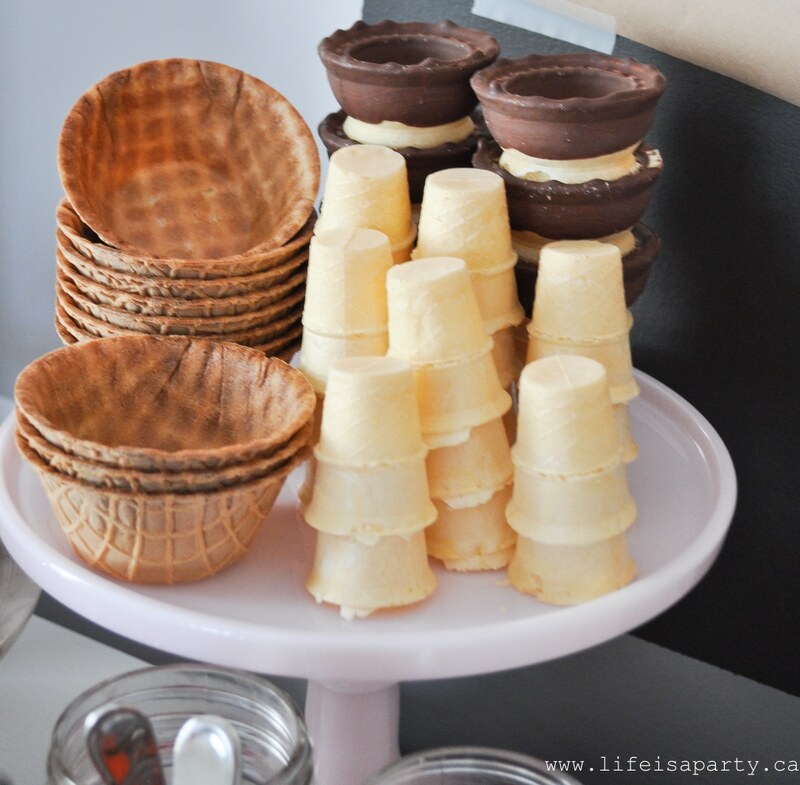 We used these wood veneer cones as the perfect ice cream cones. The wood veneer cones are usually used for food service, all we had to do was cut off the tip to make them look more like real ice cream cones. 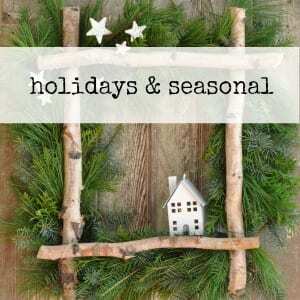 If you couldn’t find these though, you could make the cones from some kraft paper, or brown construction paper. 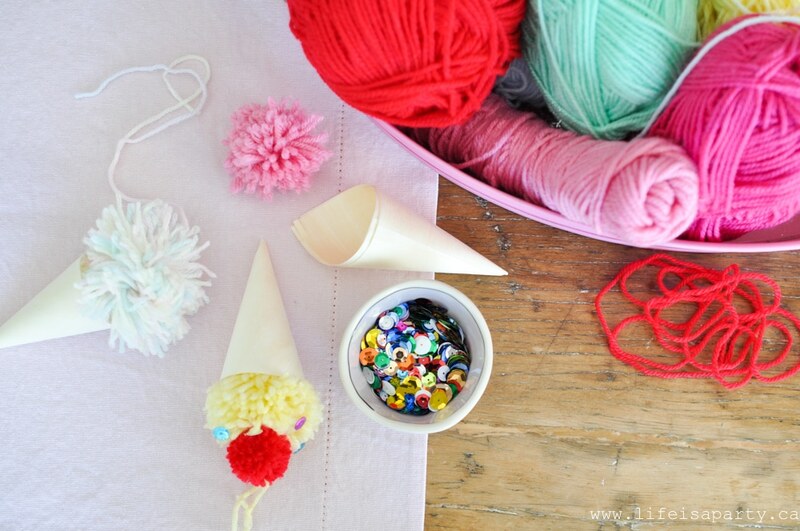 Next, we made a large pom pom as the scoop of ice cream. Then we made a much smaller bright red, or dark pink pom pom as a cherry on top. 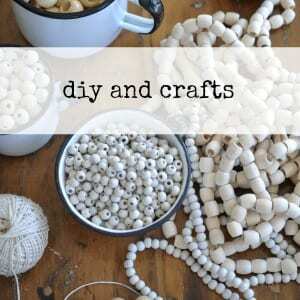 If the children were too small to make their own pom poms, you could use ready made ones. 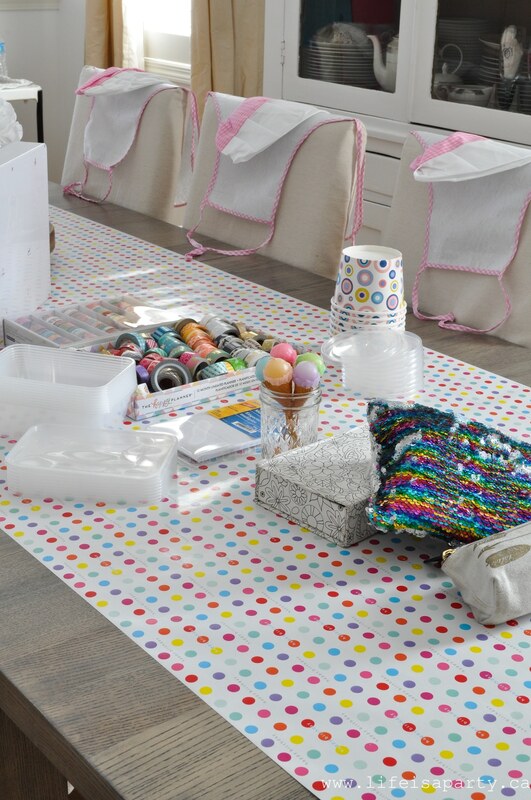 Lastly, we hot glued the pom pom into place and added some sequins as sprinkles. 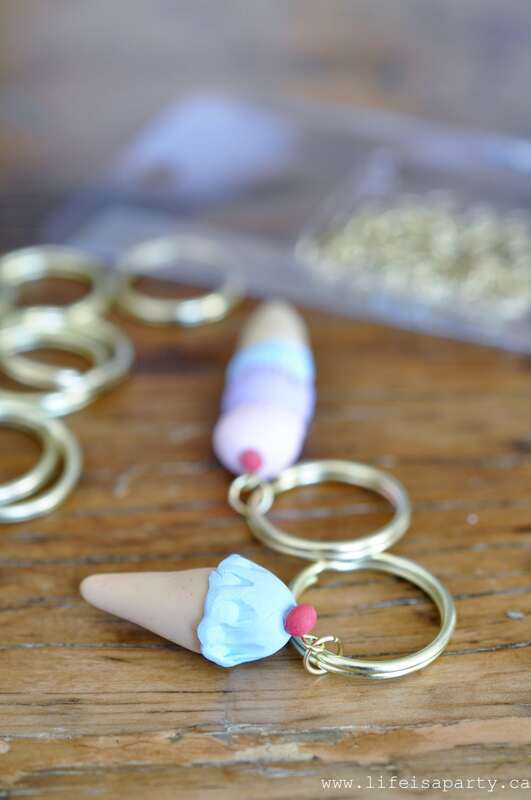 My daughter loves crafts so we also made ice cream cone key chains or necklaces. We started by shaping an ice cream cone out of brown/beige polymer clay, and then adding one, two, or three scoops of ice cream. We used the serrated edge of a plastic knife to create the ruffled edge of each scoop of ice cream. Everyone could choose their colours of ice cream and how many scoops to add. To finish it off we made a tiny cherry for the top. I used wire cutters to shorten the eye pin so that it was shorter than the finished ice cream cone. Then I carefully inserted it into the cone, so we’d be able to attach a jump ring to it. Next, we baked the cones for about 5 min. to set the clay. To make it easy, I lined a baking tray with parchment paper and wrote everyone’s name beside theirs with a sharpie. Once they were cooled I called up each girl and asked if she’d like a key chain or a necklace. 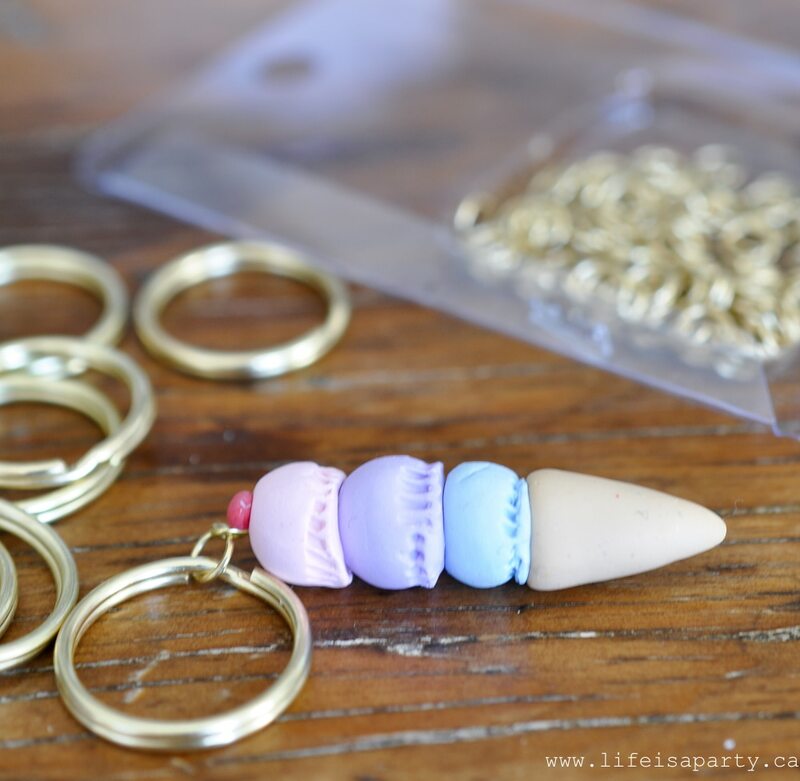 Then I added a jump ring to the ice cream cones, and then attached them to the key chain, or a necklace chain. 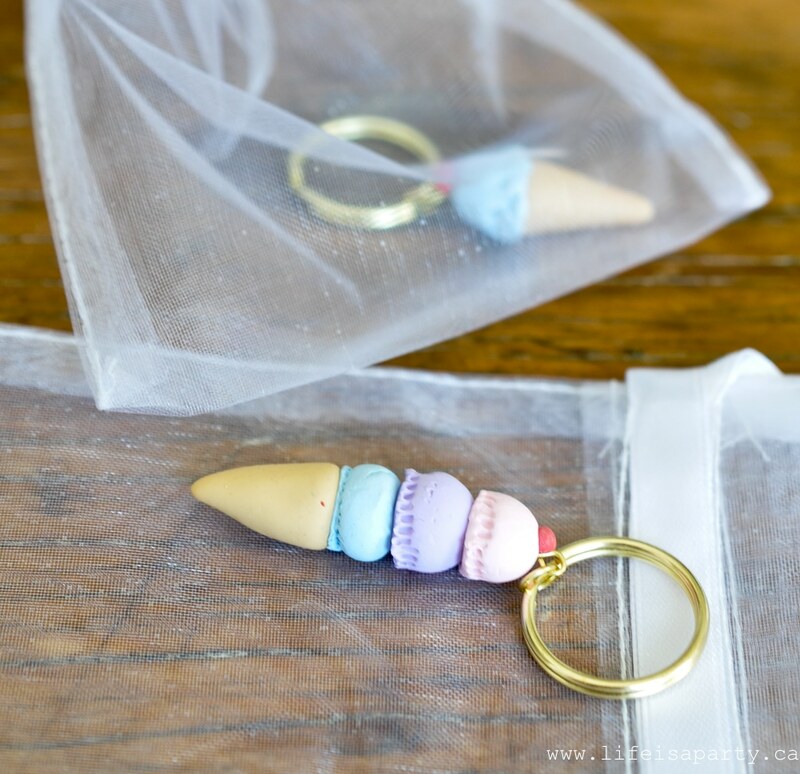 I used some small organza bags to put the finished key chain and necklaces into, and then we put them into everyone’s loot bags to take home. Everyone loved the blind ice cream tasting. We asked the girls to find a partner, and for one of them to blind fold themselves. Their partner then gave them a taste of the three different samples of ice cream and guessed which flavour they were. Then the girls switched places, and we had another three different ice cream samples for them to try. The girls all had a little piece of paper to write their guesses on. 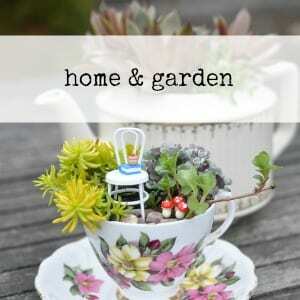 This was one of everyone’s favourite activities and was easy to put together. What was everyone’s number one favourite activity at the party? It had to be eating ice cream! 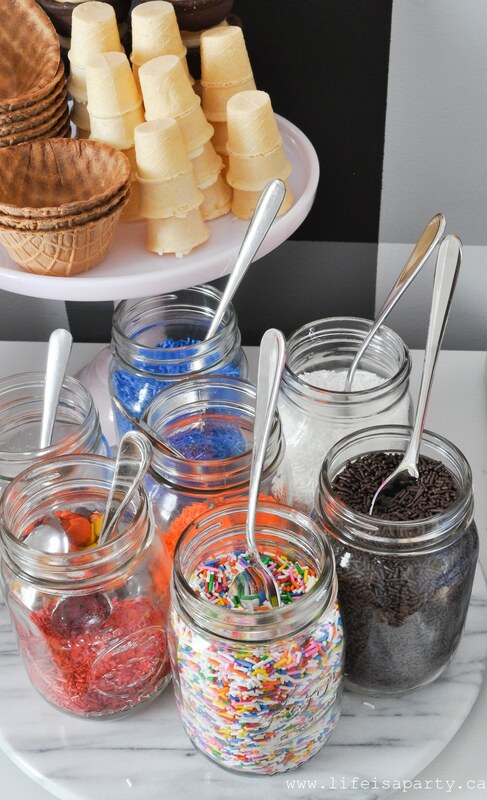 We set up an amazing ice cream buffet for everyone to enjoy after lunch. We started with lots of ice cream flavours. In order to keep it all from melting, I put some of the smaller ones into a galvanized pail of ice. We had lots of different ice cream cones and waffle bowls to choose from. In addition to these though, and everyone’s favourite were the fresh homemade waffle cones we made. We picked up a new waffle cone maker for the party. One of the activities for the party was making the batter together. Then my awesome sister worked away cooking them and forming them into cones (the tricky part). 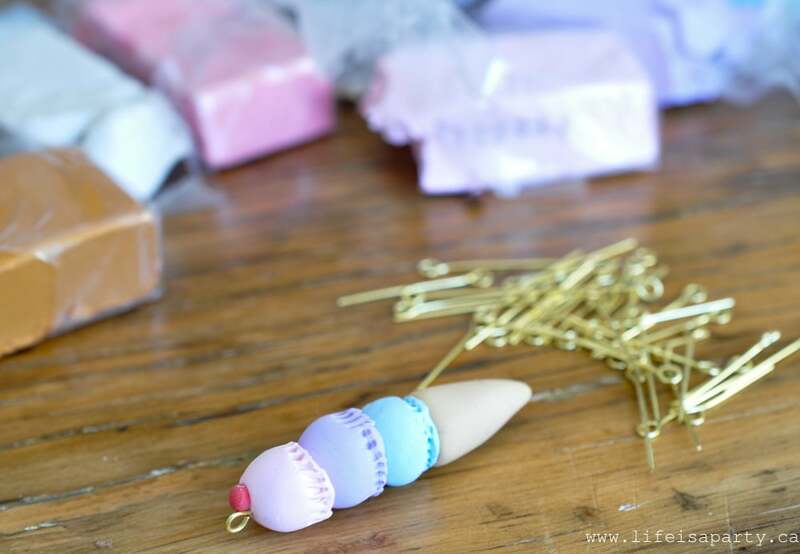 They made the whole house smell amazing and were such a fun addition to the party. We had lots of different toppings for the ice cream. 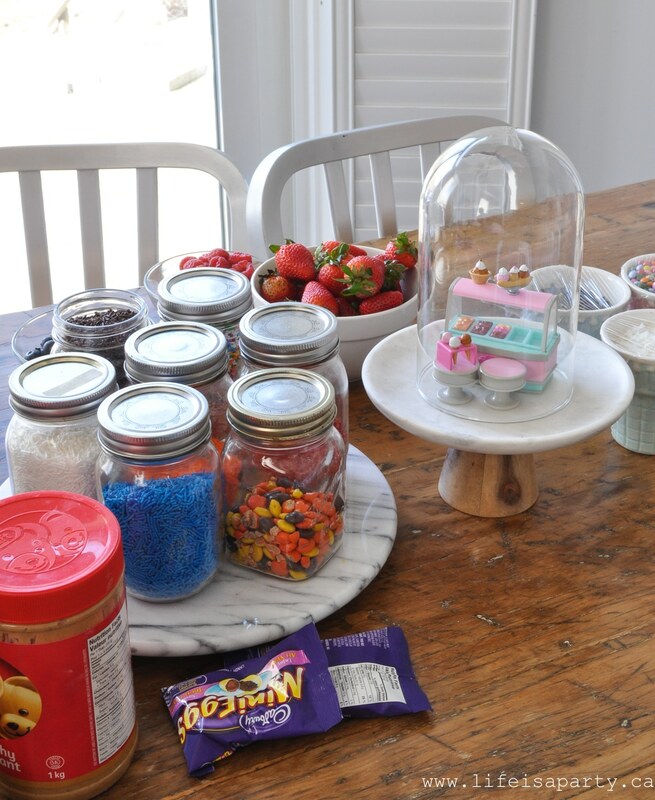 I had loads of different sprinkles in mason jars, and had them on a little lazy susan so everyone could easily help themselves -and boy were they a hit with the kids! 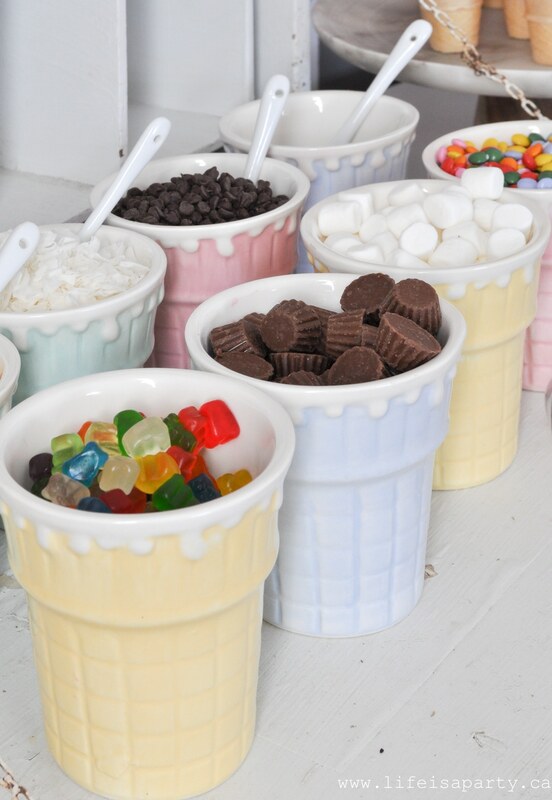 We also had lots and lots of little candies, and nuts, and chocolates to add on top in the cutest ice cream cone dishes. We also had some ice cream sauces -chocolate, caramel, and strawberry, whip cream, and the requisite cherry! 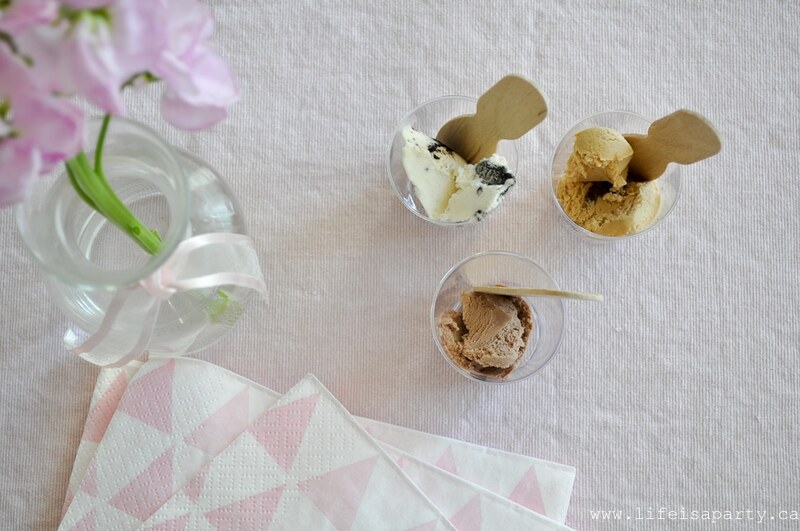 Another fun addition were these little ice cream cones made with rice krispies. Maddie used mini ice cream cones as the base, and added a small ball of rice krispies dipped in pink chocolate. She added some sprinkles and a red M&M for a cherry while the chocolate was still not set so they would stick. They were so cute, and delicious. 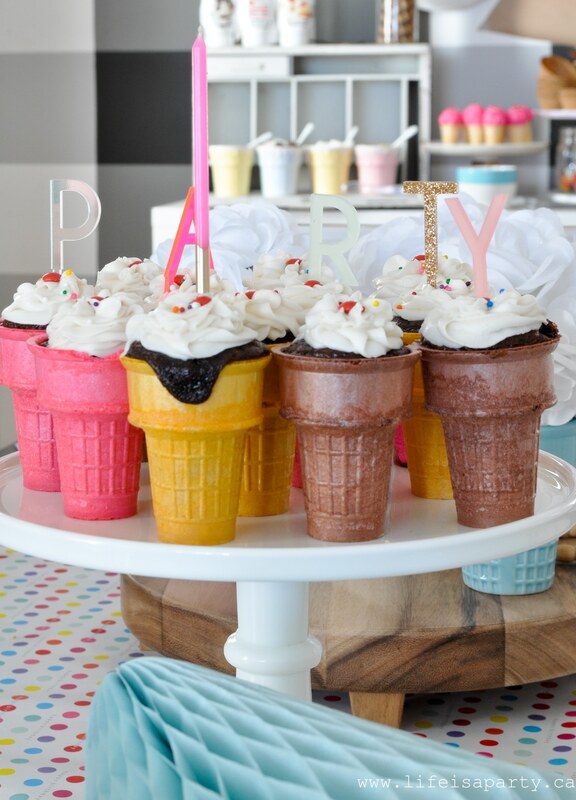 And the final deserts were these ice cream cone cupcakes. 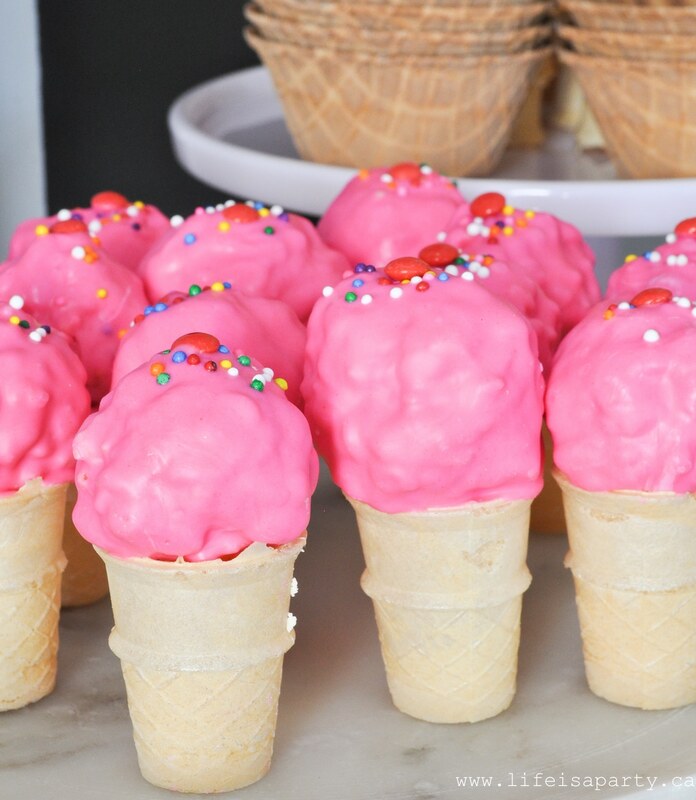 We baked normal cake batter inside some ice cream cones instead of cupcake liners. Then we added icing, sprinkles and a candy cherry. They were so sweet. This party was so fun! And I didn’t take any photos of the final activity. We set up a pretend ice cream store in the basement. 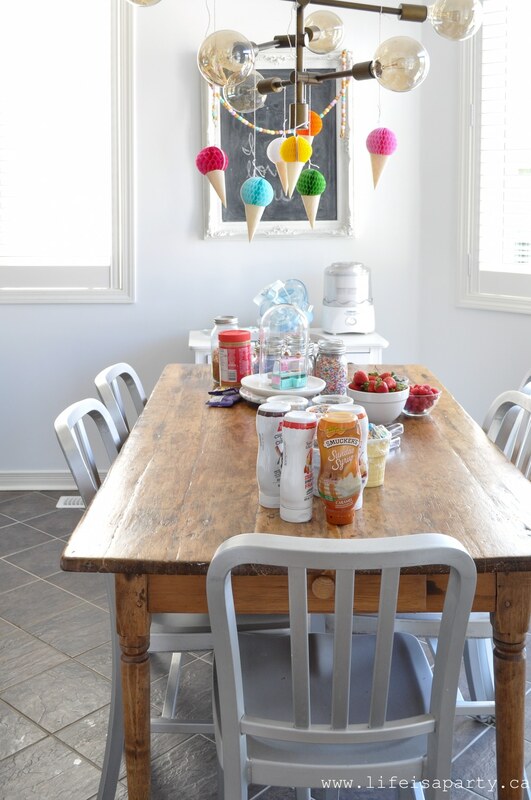 You can see how I made a similar one for another ice cream party when my girls were much younger. Maddie set up a menu, and some tables and chairs. There was a little kitchen and order desk for customers. 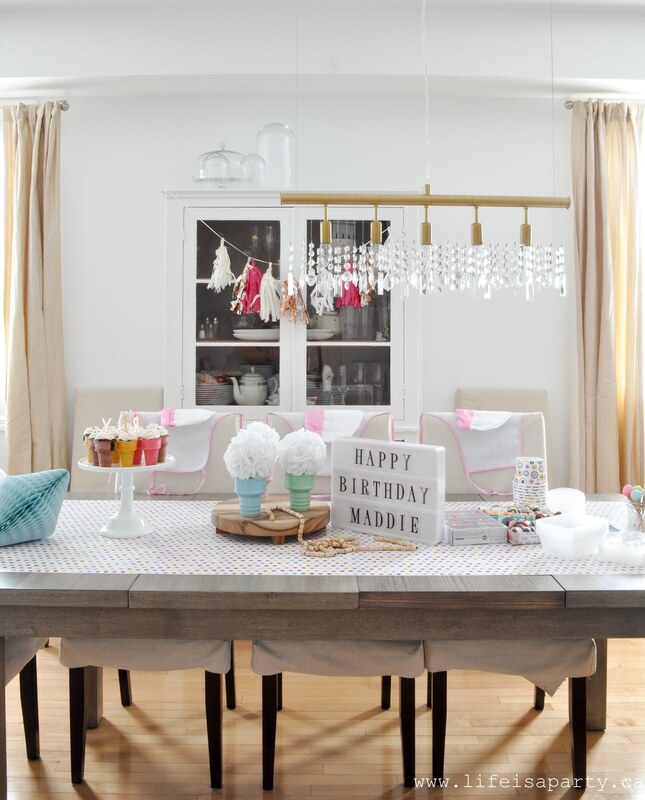 She made ice cream out of tissue paper balls, and sprinkles and cherries out of pom poms. The cones were a combination of paper ones and real ones. 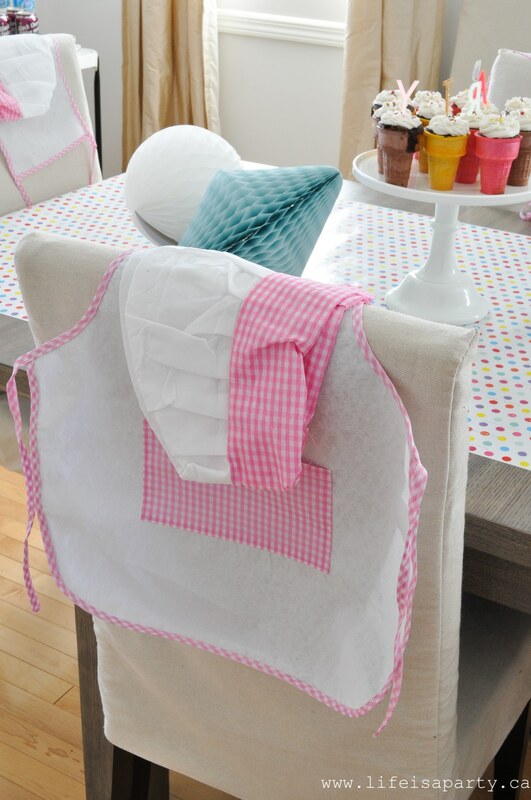 She had pretend syrup bottles, little cute paper bowls and spoons and ice cream themed napkins. There was toy money and a toy cash register, and costumes for the all the girls to dress up in. She’s growing up so fast. It did my heart good to see that what she really still wanted to do was have her little friends over and really play. I’m sure these days are really limited now, but for the last half hour of the party, with bellies full of real ice cream, they played and played, and laughed and played some more until their parents arrived. 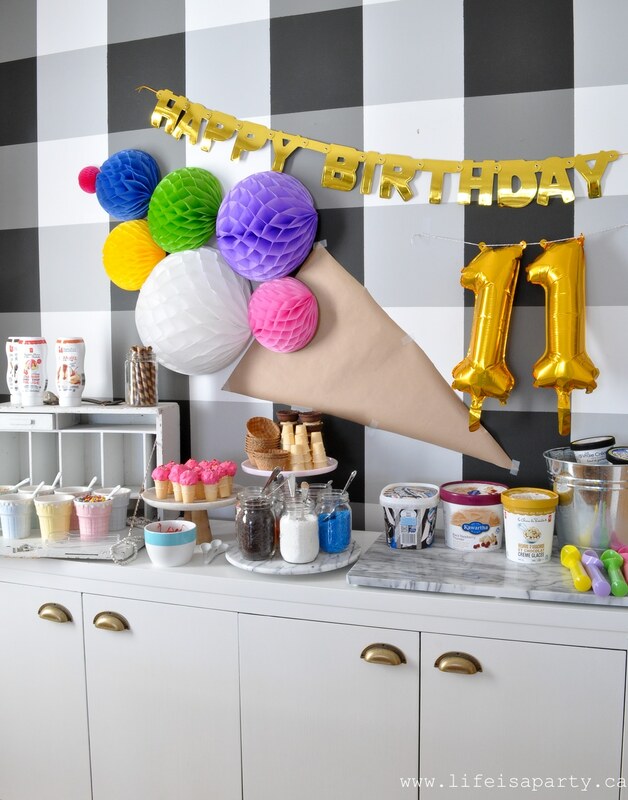 With this many great Ice Cream Party Activities, life really is a party. In case you missed it, be sure to check out Part I of this Ice Cream Party here, where we talked all about the Ice Cream Party Decorations. whoa! 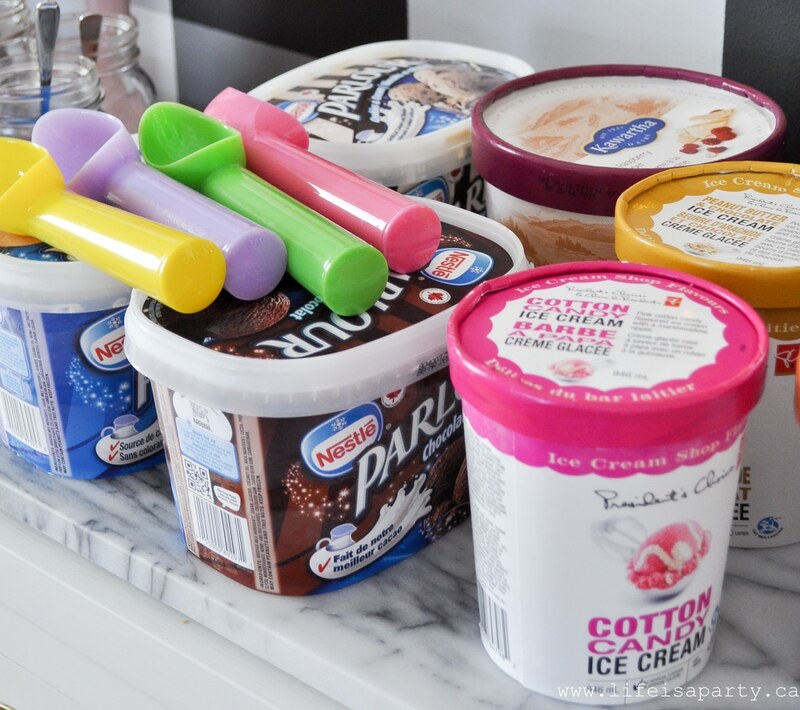 my husband would love this for his 40th, lol, he looooves ice cream. the taste test is so smart, and that wall decor is top notch! !